Modified for being too heavy, Spain's submarines are now too long! The old proverb For want of a nail about a king who lost his kingdom because his horse had a faulty shoe nail is a staple in school to teach us that the little things can make a world of difference. Like a mistake caused by a misplaced decimal point that can take years and cost billions to rectify! The S-80 class of submarines was conceived by Spain's Navantia to be a formidable ocean-going vessel that could do a variety of offensive and surveillance roles and also be a serious contender on the export market, for long dominated by French and German companies. However, the S-80 project has seemingly become a laughing stock for technology mismanagement and planning. The first of four S-80 class submarines was expected to be ready by 2015, but its builders and the Spanish Navy uncovered a potentially fatal flaw in its design in 2013. The first S-80 was over 100 tonnes heavier than specified and serious doubts emerged about its capability to resurface from underwater. Personnel in Spain's ministry of defence later attributed the problem to the fact that the design team had “misplaced” a decimal point in weight calculations and the navy had added new systems to the submarines. To modify the defects on the S-80 design, the Spanish government contracted the services of an American submarine builder, Electric Boat. Electric Boat and Navantia then “resolved” the weight problem of the S-80, by lengthening the submarine's hull by over 8 metres to nearly 80 metres, also adding hundreds of tonnes in displacement. The S-80 submarines, which will now displace over 3,000 tonnes underwater, have a new problem, though—they are now too long to be docked at the Spanish Navy's base at Cartagena. The new problem with the S-80 submarine, which was reported by Spanish media recently, has been acknowledged by the Spanish government. Modification of the facilities at Cartagena is expected to cost around euro 16 million. That amount, however, is small change compared with the fact that the cost of the S-80 project is expected to reach nearly euro 4 billion, from the initial budget—allocated in the previous decade—of euro 2 billion. As a result of the weight and length problems, the first S-80 submarine is expected to enter service only by 2022, nearly seven years late. The submarine is also having problems with its fuel cell air-independent propulsion (AIP) system; AIP will allow the submarine to remain underwater for weeks at a time, unlike the current combination of diesel-electric propulsion, which can't last beyond a few days. The S-80 submarine was meant to be a decisive force on the export market, with Navantia offering it to Australia and India in the past. Its larger diameter, endurance and ability to carry land-attack missiles was meant to differentiate the S-80 from smaller vessels built by Germany and France. 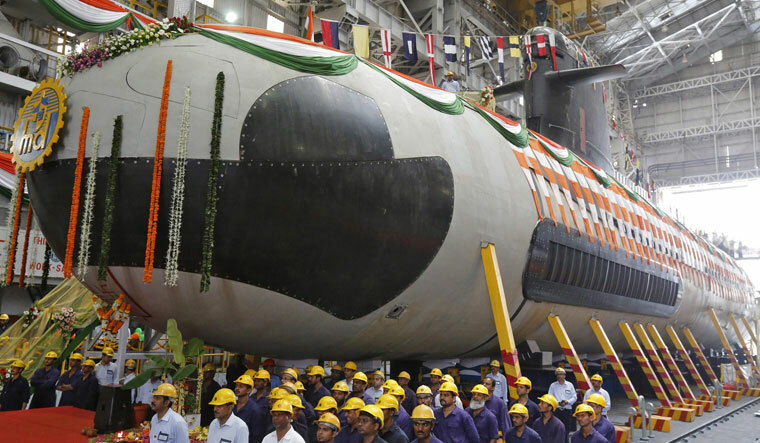 The S-80, incidentally, has some commonality with the Scorpene-class submarine, which India is building as France and Spain had initially collaborate on the latter. The S-80 was being offered for the Indian Navy's Project-75I class of submarines; Navantia pulled out of contention for the project in 2017. The export possibilities for the S-80 may well stay a mirage now, perhaps, thanks to a decimal point.